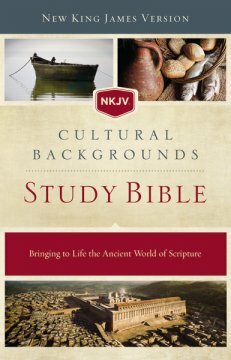 The NKJV Cultural Backgrounds Study Bible By Craig S. Keener ; John H. Walton, General Editors Published by Zondervan is more than just a bible- it brings the culture and historical context of the bible to life. This bible is now available in the NIV and NKJV as well. This is a beautiful study bible- full of articles, full color photos and diagrams. If you are looking for a study bible- you will not be disappointed! Every page features either an article, photograph or informative graphic. This bible is far more advanced than a traditional study bible. Full color graphic study bibles started with the prototypical Archeological study bible printed years ago. There is some resemblance to the out of print Archeological study bible, and the newly published First Century bible also by Zondervan. If you want to own one single bible that is good for study as well as beautifully designed and illustrated, the full color Cultural Backgrounds Study Bible is the really the only bible you will need. This bible has every study feature you could ever ask for in a bible- including historical, theological and life application information. This bible is full of full color photos, maps, charts, illustrations as well as the tiny footnotes- traditional study notes on the bottom of the page. It is like a history book and bible rolled into one volume. This bible is great for new bible readers as well experienced readers.